In this instalment, Professor J.T. Meinhardt and Mr. Knox continue their pursuit of ne’er-do-well creatures of the night. Now, backed by the dauntless vampire hunter Ms. Mary Van Sloan, the heroes pursue vampires, werewolves, and other horrors that even they are hard-put to name or explain. The only thing that’s for certain? The strange truths these adventurers uncover are seldom what they seem. Dark Horse will publish the hardcover graphic novel―created by Mike Mignola and Warwick Johnson-Cadwell, with story and art by Warwick Johnson-Cadwell, lettering by Clem Robins and a cover by Mike Mignola with Eisner Award-winning colorist Dave Stewart―in comic shops and bookstores in October, ahead of Halloween. 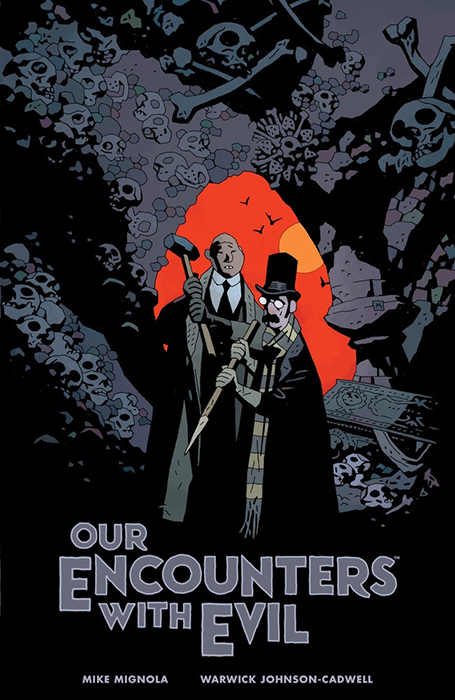 Dark Horse Comics will release Our Encounters With Evil: Adventures Of Professor JT Meinhardt And His Assistant Mr Knox as a hardcover graphic novel in comic shops on October 9 and in bookstores on 22 October. This October, fans can grab some garlic and silver bullets, and settle in for an endearingly terrifying tale, chock full of the occult and adventure. For more information about Our Encounters With Evil: Adventures Of Professor JT Meinhardt And His Assistant Mr Knox , follow Dark Horse Comics on Twitter, Facebook and Instagram. Reading DRACULA at ago 12 introduced Mike Mignola to Folklore and Victorian Supernatural Literature from which he has still never recovered. He began working as a comic book artist in 1982, working for both Marvel and DC Comics before creating HELLBOY, published by Dark Horse Comics in 1994. What began as a single comic book series would eventually expand to a “Hellboy Universe” of related graphic novels, prose novels, short story anthologies and both animated and live action films. He also wrote and drew THE AMAZING SCREW-ON HEAD AND OTHER CURIOUS OBJECTS. He has co-written novels with Christopher Golden (Baltimore, or, The Steadfast Tin Soldier and the Vampire) and Thomas Sniegoski (Grim Death and Bill The Electrocuted Criminal), worked with Francis Ford Coppola on BRAM STOKER’S DRACULA, was a production designer on Disney’s ATLANTIS: THE LOST EMPIRE, and visual consultant to Guillermo Del Toro on BLADE II, HELLBOY and HELLBOY II: THE GOLDEN ARMY. A new HELLBOY film directed by Neil Marshall will be released this spring.Mike’s comics and graphic novels have earned numerous awards and are published in a great many countries He lives in Southern California with his wife and a very demanding cat. Warwick Johnson- Cadwell has been drawing as long as he can remember, enthusiastically digesting comics and transposing James Bond, spaghetti westerns and Hammer Horror movies onto paper. This drawing persisted, taking him through an Illustration degree and on to work in Publishing with work for The Guardian and The Times newspapers. Animation Design for several projects in commercial or features studios including Aardman Animation’s Pirates! 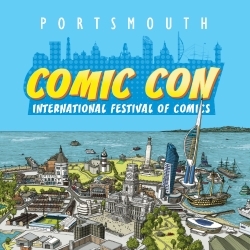 His comic work has featured in Nelson (2011) Lovecraft Anthology 2 (2012) Sold State Tank Girl (2013) Samuari Jack (2018), and many “Small Press” titles including Dangeritis (2014) with Robert Ball. He also skippers boats on the South coast of England. He collaborated on HELENA CRASH, with Fabian Rangel Jr. and, most recently, MR. HIGGINS COMES HOME with Mike Mignola. Founded in 1986 by Mike Richardson, Dark Horse Comics is an excellent example of how integrity and innovation can help broaden a unique storytelling medium and transform a company with humble beginnings into an industry giant. Under a new partnership with Vanguard Visionary Associates, Dark Horse is positioned to further expand its reach globally with publishing, products, and filmed entertainment. Over the years, Dark Horse has published the work of creative legends such as Yoshitaka Amano, Margaret Atwood, Paul Chadwick, Geof Darrow, Will Eisner, Neil Gaiman, Dave Gibbons, Faith Erin Hicks, Kazuo Koike, Matt Kindt, Jeff Lemire, Mike Mignola, Frank Miller, Moebius, Chuck Palahniuk, Wendy Pini, and Gerard Way. In addition, Dark Horse has a long tradition of establishing exciting new creative talent throughout all of its divisions. The company has also set the industry standard for quality licensed comics, graphic novels, collectibles, and art books, including Aliens, Stranger Things, Avatar: The Last Airbender, The Legend of Korra, Predator, Minecraft, The Legend of Zelda, Super Mario, Dragon Age, James Cameron’s Avatar, Game of Thrones, Mass Effect, StarCraft, The Witcher, and Halo. Today, Dark Horse Comics is one of the world’s leading entertainment publishers.